The S2Q-PA Sterilight UV system provides point-of-use water disinfection of 4GPM at 16mJ/cm² - 3GPM at 30mJ/cm² - 2GPM at 40mJ/cm² UV dose. 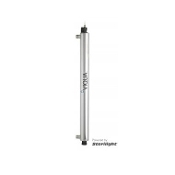 This UV system is ideal for under the sink water supply disinfection. The Silver controller provides constant output current at 100-240V 50/60Hz, as well as visually displaying remaining lamp life and total days of operation. Sterilume EX coated germicidal UV lamps are used to provide an economical way of treating water for 99.99% microbial reduction. The S2Q-PA reactor is made of 304 stainless steel with 1/2" MNPT connections. Lamp change is easily accomplished without interrupting the water flow and the over-molded connector can be removed without any additional tools.